Welcome to the 2019 Faculty and Staff Campaign! As your Co-chairs, we could not be more pleased to champion such an important initiative. The theme for this year is “Raising the Bar,” which echoes our bold aspirations to go beyond what we believe is possible. While our “Here, We Go” Campaign has achieved a remarkable milestone, our journey is not over. We have much more that we want to accomplish as a higher education institution of the 21st century. Whether through student and faculty support, facility enhancements or research initiatives, there are many areas where you can create transformative change in the life of the University. Each week during the Campaign, you will receive messages about these priorities and how your investment can move the needle. As faculty and staff, we have the power to ensure UH remains true to its mission. 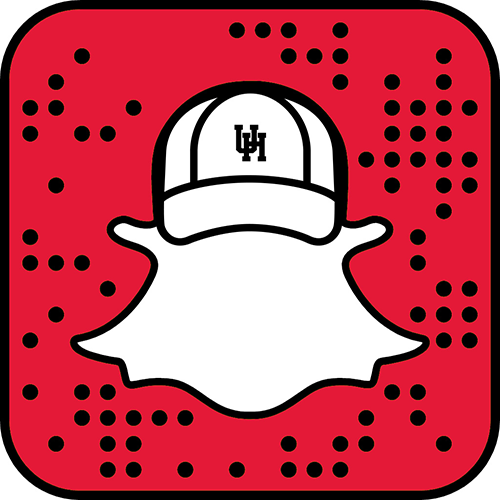 Join us as we work to ensure UH remains at the pinnacle of enduring success. Let’s raise the bar! 1. Why is faculty and staff giving important to UH? 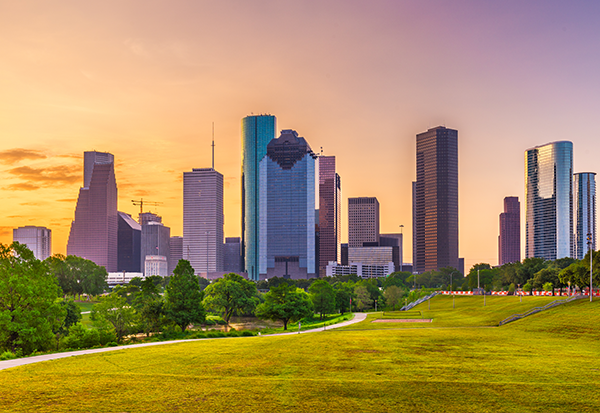 The $1 Billion Campaign for the University of Houston is the largest fundraising effort UH has experienced in more than 25 years. We have entered an era of unprecedented revitalization and growth that will position us to be even better prepared — in terms of facilities, technology and people — to serve the evolving needs of our students, our community and the world. We all have a stake in UH’s continued progress. Our support will send a powerful message that is sure to inspire potential contributors. 2. Who can participate in the campaign? All full-time, part-time and adjunct employees are encouraged to participate. Additionally, if you are a UH graduate, your gift to the campaign will also impact the University’s alumni participation rate, which is reported to U.S. News & World Report. 3. How can I contribute to the Faculty & Staff Campaign? There are several ways. By far the most popular option is payroll deduction. A modest monthly contribution can, over several years, multiply into a sizeable gift. If you prefer, you can also make a one-time gift. To make your gift: Online at https://giving.uh.edu/uhgivesback/ and through the Pledge and Payroll Deduction form. 4. Does it matter how much I give? The goal of the Faculty & Staff Campaign is participation. It’s not about the size of the gift. It’s about the participation rate, and we truly hope we can achieve 100 percent participation. 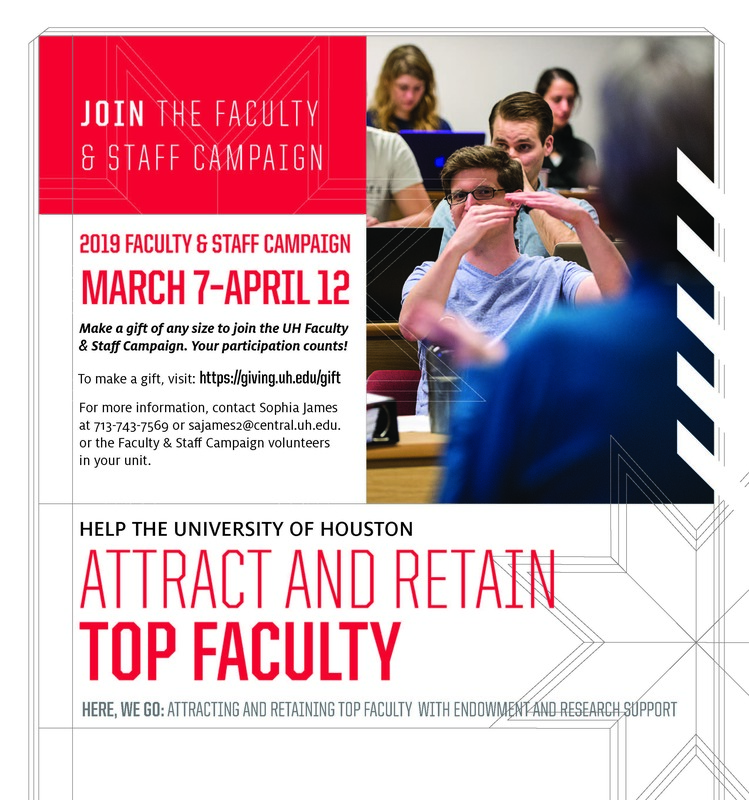 Faculty and staff participation is measured by the number of current full-time faculty and staff donors divided by the total number of current full-time and permanent part-time UH faculty and staff. 5. Is there a minimum amount for payroll deduction? 6. Where can I direct my gift? Whether you make a gift to support endowments to recruit and retain outstanding faculty, invest in the University’s research enterprise or provide scholarships to ensure deserving students can follow their dreams, you are helping to transform the future of our University. In fact, all gifts to the University from faculty, staff and retirees will count toward the campaign. So no matter where you direct your contribution, you’ll help UH. A complete list of giving options can be found in the drop-down menu of the Pledge Form on the online giving page at https://giving.uh.edu/uhgivesback/ or through the Payroll Deduction Form in P.A.S.S. 7. Can I give in memory or in honor of someone? Absolutely. Many people make gifts to UH in memory of a loved one, in honor of a trusted colleague, or in appreciation of a beloved faculty member for the exceptional education they provided. 8. Is my gift tax-deductible? Yes! All gifts to UH through the Faculty & Staff Campaign are tax deductible to the extent allowable by law. 9. I have already made a gift this fiscal year to my college faculty and staff campaign. Does this count in the campaign? Yes! All gifts made by UH employees from 9/1/2017 to 8/31/2018 will be counted in this year’s campaign. 10. When will my payroll deduction start? If you start a new payroll deduction or change a current payroll deduction, the new deduction will begin as HR uploads these changes. (Payroll deduction can take up to 3 weeks to start, based on when the form is received.) To ensure prompt accounting of your gift, we recommend submitting your gift to Gift Processing and Records as noted in #3 of this document. 11. Can I make a gift jointly with my spouse or partner? Yes! Indicate on the payroll deduction form or the gift card that the contribution is a joint gift and provide your name and the name of your spouse or partner. If your spouse or partner also works at UH, he/she will also receive credit for participation. 12. Will my gift be matched? If your spouse works for a matching gift organization, your gift can be matched. Simply indicate that information on your pledge form and ask your spouse to complete their company’s matching gift request form. 13. Who knows if I’ve made a gift? Gift amounts are always confidential and will never be shared with anyone. You have the option to have your gift recognized/publicized by name only, or you can choose to remain anonymous. 14. What if I leave UH before my pledge is completed? Your pledge is considered a good-faith intention; it is not considered a debt. We realize that personal circumstances can change. So if you find you need to change your pledge, we encourage you to call the Advancement Office to discuss it with us. 15. Who receives participation credit for my gift? Each UH employee’s participation is credited to the unit in which they work. Human resources determines where an employee’s employment assignment. 16. How do I make a naming gift? For a qualifying naming opportunity (endowed scholarships, space naming, etc., a UH Development Officer is available to help. 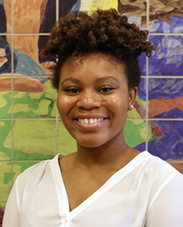 Please contact Sophia James at 713-743-7569 or sajames2@central.uh.edu. 17. If I make a naming gift, do I need to pay it out all at once? No. Pledges to the campaign can be fulfilled over a period of up to five years. Many have found that fulfilling a pledge over several years can be a great way to make a larger gift to UH than they originally thought possible. We have made it to the last week of the 2019 Faculty and Staff Campaign, and we’re drawing our attention to the important role athletics plays in the life of the University. It’s been said that a successful athletics program engages and energizes a school’s student body and alumni like no other. 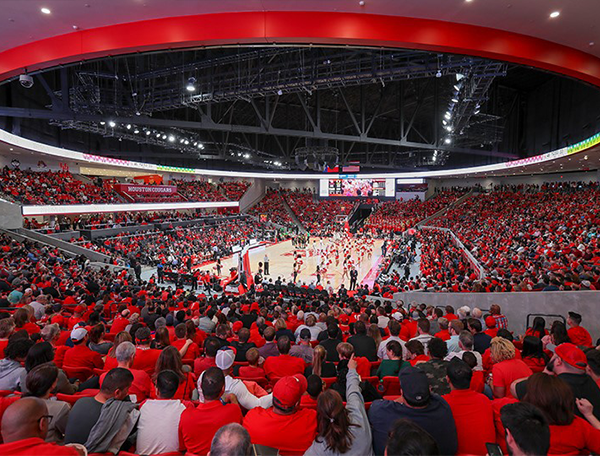 To continue our resurgence on a national level, the University is focused on investing in and retaining world-class students and faculty as well as enhanced opportunities to improve the fan experience. Let’s unite to achieve our mutual long term goals on and off the field! We hope you have enjoyed learning about the many ways you can impact the University and its students. As faculty and staff, we are in a unique position to see how our generosity moves the needle, and we hope you take this time to celebrate the successes you have helped create. 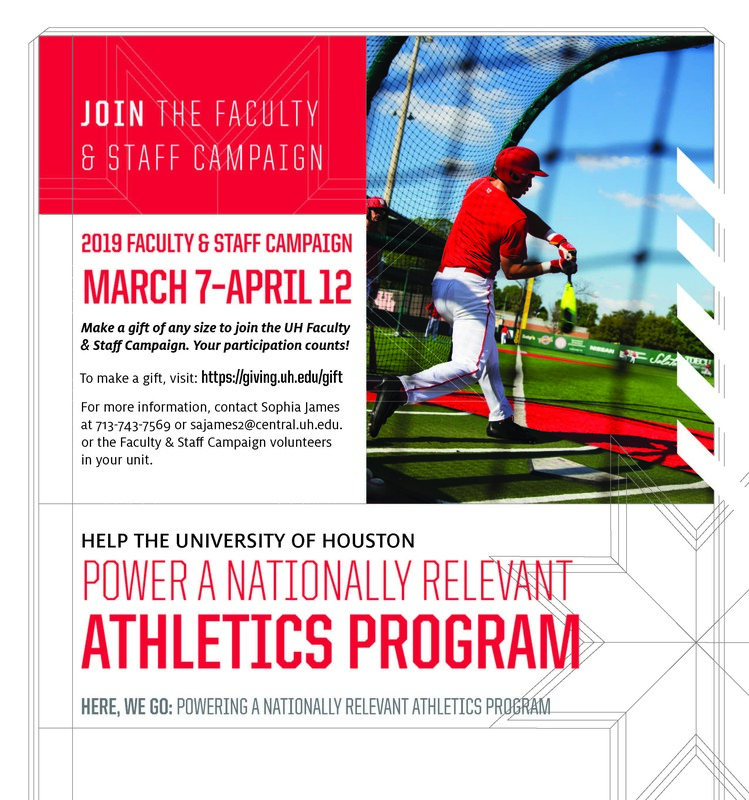 With only two weeks remaining in our Faculty and Staff Campaign, there is still time to take UH to the next level and beyond. From student scholarships, renowned faculty, new facilities, and top rated athletics, we have witnessed transformation in the making. And we can still do more to propel the University into an even more impressive institution. With more than 63 percent of our alumni choosing to remain in the region, your gift not only impacts the lives of our students and entire campus community, but also fuels our local economy. Great cities cannot thrive without a premier public university that empowers future leaders to be engines of intellectual and economic success. With Tier One academics and resources, the University is well-positioned for enduring growth and longevity, but we need your help to continue on this path. We are now right in the middle of our Faculty and Staff Campaign, and our message today brings our dedicated faculty into central focus. With 2,700+ faculty members, the University is well-positioned for groundbreaking research and innovative discovery. Leaders in their fields, our faculty elevate the University to new heights of distinction each and every day. Through endowments and research support, our faculty are able to transcend what is possible and solve today’s most complex challenges. As faculty members significantly contribute to the University’s upward trajectory and our students’ academic journey, we must ensure that we have the proper tools and resources to attract and retain them accordingly. You can help us do just that by contributing to the Faculty and Staff Campaign today. Welcome to week two of the UH Faculty and Staff Campaign where we shift our focus to enhancing students resources through state-of-the-art facilities. 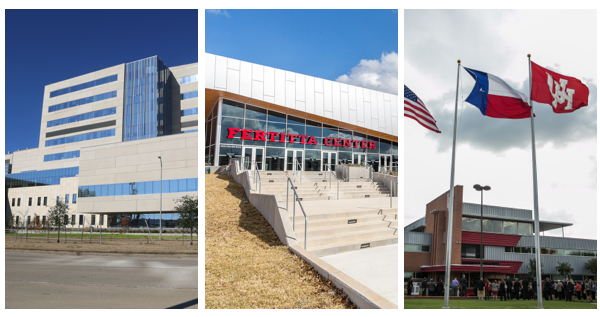 Since the launch of the “Here, We Go” Campaign, our giving community has truly risen to the occasion, investing in facilities that serve as a testament to the culture of philanthropy that exists at the University of Houston. The University will continue to invest in new academic spaces, teaching/research labs and infrastructure support to sustain and enhance campus resources, providing the means for our students to be successful in their academic journey. You can play a role in helping shape the landscape of higher education at UH by making a gift to the Faculty and Staff Campaign. 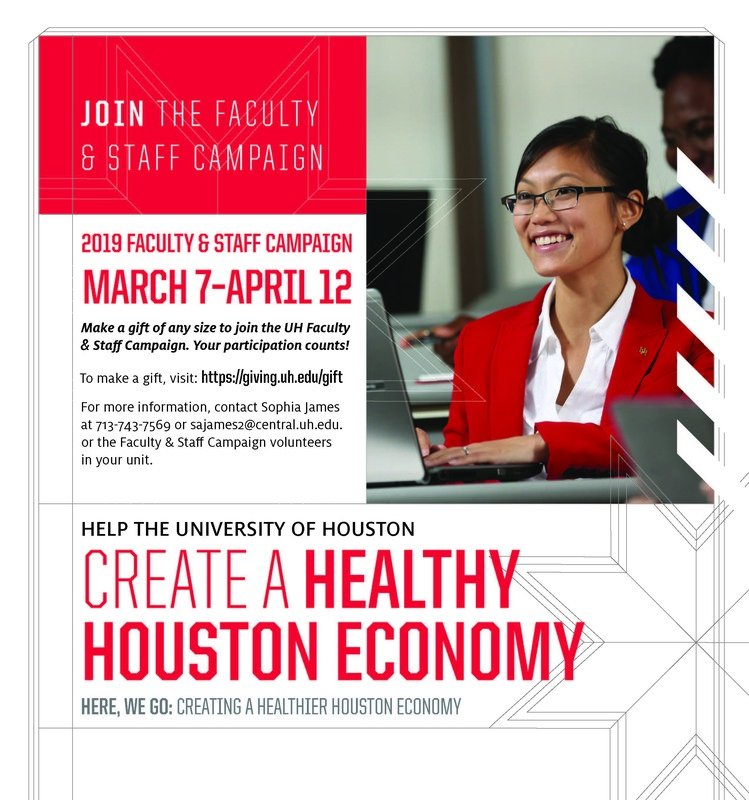 Welcome to week one of the 2019 Faculty and Staff Campaign at the University of Houston! This is an exciting time in the life of the University, and we can all take part in shaping a stronger, more vibrant institution for our students, faculty and entire campus community. In concert with the University’s “Here, We Go” Campaign, the Faculty and Staff Campaign aims to support five core priorities: Scholarships and Fellowships, State-of-the-Art Facilities, Top Faculty, a Healthy Economy, and a Nationally Relevant Athletics Program. This week, we are focusing on one of the many factors that contribute to our students’ long-term success — scholarships and fellowships. Scholarships and fellowships open doors of opportunity, allowing students to realize their full potential without financial limitations. These resources also allow the University to attract and recruit high-caliber students who are ready to contribute and make real impact.